Naturally caffeine free. 4 calories per cup. Sugar free.All Natural Ingredients* *All our herbs are gently steamed, the process is gentle to protect their delicate taste Sometimes everything seems to whizz by so quickly, like being spun around on the dancefloor. Pause for a while and take a break, before continuing on to your own rhythm. What does it taste like? 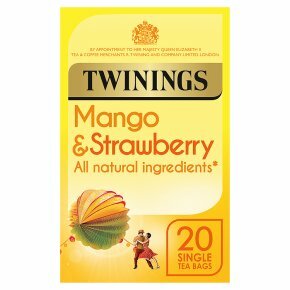 The familiar sweetness of strawberries dances with the exotic, rich aroma of mangoes to create this deliciously refreshing blend. How do I drink it? Using one bag per person, pour on boiling water and infuse for three to four minutes. Leave for a little longer if you prefer a stronger taste.